UPDATE: We’re working on this season’s map. Pick up a free copy in Euphoria, and all good bars in Bansko. 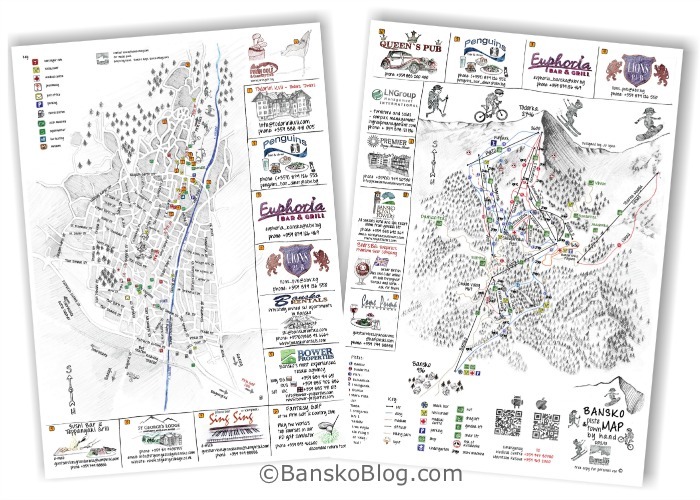 To celebrate the glistening Bansko snow this week, the Bansko map is ready. On one side is the town map and the other the piste map. Please feel free to print this out for personal use, or pick up your free copy in many places around the resort. Permission is granted for personal use only. These maps should not be placed on websites or other digital media without prior permission. If you like this, then you’ll love the piste maps lens cloths. Every body in your group receives on of these absolutely free for all bookings made here, on BanskoBlog.com and in Bansko App. If the map is useful to find your way around both on and off the slopes then great.. However if you have internet then both maps are on the Android and iOS (Apple) Bansko apps. All the advertisers are also listed un the places section in the app. So finding all sorts of places in Bansko has become a lot easier. In addition to these maps, a big upgrade is under way for the interactive listing on the Bansko App for both iOS and Android. The app shows useful info such as gondola lift location, restaurants, bars, clubs and other businesses. This expanding list is viewable on the app from wherever you are located. When in Bansko, the mobile app shows your current location with a blue pin and the places with red pins. This will help you find the venue. book your ski hire, lessons, lift passes and transfers here. Need help? please use the chat function. download the Bansko app today and if you like it, please rate it. you should follow me on twitter for the very latest updates. would it be possible to leave some piste and street maps with george at ski mania tomorrow be in between 4-5,cheers hope to see you sometime. Yes George has a bog supply of the town and piste maps, by hand. I hope to see you there. Od ,and a shameless plug for the Bansko app (iOS and Android), if you like it then rate it!